You may hardwire this circuit to a breadboard or use the available PCB board. 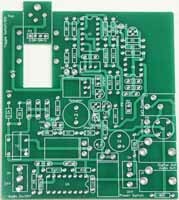 Although you do not need the PCB, the PCB will may construction easier. 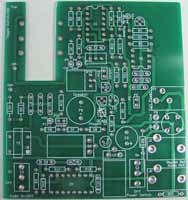 The top silkscreen of the PCB is shown in Figure 5. Begin construction by soldering resistors R17 5.6K (color bands green, blue, red), R18 4.3K (color bands yellow, orange, red) and R9 15K (color bands brown, green, orange). Next we will wire the square wave generator and pulse shaping circuit using the ICS-16 socket for the 4049, marked U4 on PCB. Insert the ICS-16, making sure to orient the notch on socket to the drawing on the PCB and solder to the board. Place and solder components C8 (.01uf), C9 (.0047uf), C10, (.1uf) and D10 (1N914). Now construct the high voltage section consisting of the step up transformer T2, diodes D4 & D5 (1N4007) and capacitors C3, C4 and C5 (.01uf 1KV). Mount IRF830 transistor Q2 to the PCB, bend the transistor outward so it lays flat on the PCB, see Figure 6, and solder. To this add the 5 volt 7805 regulator (U3), bending it outward so it lays flat as with transistor and solder into position. Next mount and solder capacitors C6 (220uf-330uf), C7 (22uf), and diode D9 (1N5817). Place and solder the 9-volt battery cap on the PC board. The red lead connects to the positive terminal P12. The black lead connects to GND, marked P9. Solder the power switch to the PCB at S2. Insert 4049 into the socket, making sure to orient the notch on the chip to the notch on the socket. CAUTION: Circuit generates high voltage power that can provide an electrical shock. Exercise caution when working around the high voltage section of the circuit. The capacitors C4 and C5 can hold a HV charge after the circuit has been shut off. To check the HV power supply; turn the power switch off. Insert the 9-volt battery onto the battery cap. Set up a VOM to read 500 to 1000 volts. Place the positive lead of the VOM at P11. The negative lead of the VOM is connected to the—(negative) terminal of the 9-Volt battery. Apply power to the circuit using the power switch, The circuit should generate anywhere between 550 and 800 volts (depending upon component tolerances) If you are reading between 550 and 800 volts, fine, turn off the power. Add the three zener diodes; D6 (100V) and D7 & D8 (200V). Attach a 2-pin header and jumper at P10. Apply power again,with the positive lead of the VOM still attached to P11; you should read a voltage of 380-400 volts. If you're not getting a proper voltage reading, check the zener diodes to make sure you have them orientated in the right direction.